About Treasure Cove II Inc.
Treasure Cove II Inc. is one of the largest manufacturers of ornamental precast concrete in the State of Florida. We are known for our quality products and our solid commitment to customer service. In Southwest Florida, Spanish or Tuscan Mediterranean architecture is very popular, but our versatility has allowed us to expand our product selection to compliment a wide array of architectural styles. Treasure Cove offers its’ clients an almost unlimited capacity to create custom designs in different colors and textures. Our company is dedicated to helping the client from concept to finish. 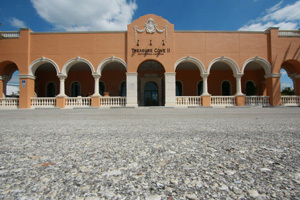 Treasure Cove is located in Sarasota, Florida and has been manufacturing architectural elements since 1985. In 2002, a 17,500 square foot manufacturing facility was completed and produces millions of pounds of individually hand cast products yearly and we do all of this with a concern for the environment. Our concrete waste is transported to a recycling facility and is then used in new road construction. Environmentally safe release agents are used in all of our stone cast molds. Treasure Cove II, Inc. manufactures its products for ornamental and decorative purposes only. We do not make structural products. We make all our products in house which makes our product line practically unlimited. To allow maximum flexibility, Treasure Cove II welcomes custom designs. Lead times for custom work vary according to the scope and difficulty of the project. We recommend that clients involve us as early in the design process as possible and remain flexible regarding the final design and the time schedule necessary to complete it. Treasure Cove II retains ownership of all patterns and molds. Those who select precast have to take into consideration that it is made from natural materials and as such, colors and textures can vary slightly. Our products will age naturally and long term maintenance will be minimal. We at Treasure Cove believe this is the beauty and character of the product.